Pink-ed Party Given @Barn Hill Community! Matura fulfilled our Pink-ed Party Promise to the community that posted the highest number of pink streaks in one day! On Feb. 8, 2018, a “THINK PINK” Certificate of Recognition was awarded to Barn Hill Care Center community for outstanding participation with a record breaking 105 Pink Streaks in our “CHANGE YOUR HAIR. CHANGE A LIFE.” Breast Cancer Awareness Event held on October 25, 2017….and then the real party began! Hosts Matura Field Manager Cathy Cox, stylists Carolyn Bindas & Kimberly Stachokus made sure there was plenty to celebrate: a salon gift certificate raffle for residents; gift bags for employees; lots & lots of pink cupcakes, cookies, krispy treats, punch and colorful balloons to honor the amazing employees & residents of Barn Hill who provided outstanding support to raise awareness about the importance of early detection in helping to increase women’s chances of survival from breast cancer. 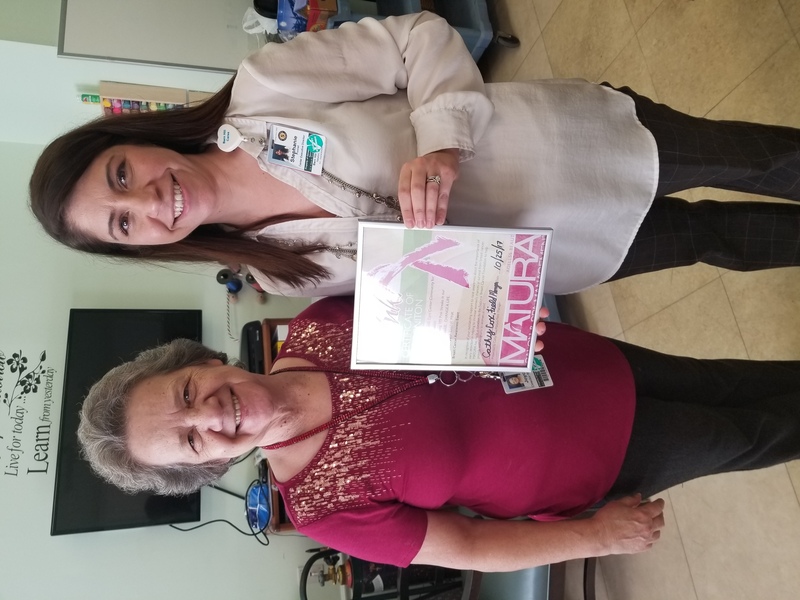 On behalf of Barn Hill Center and the more than 50 of our clients who participated in our highly successfuly THINK PINK event, Matura has made a donation to the National Breat Cancer Foundation to help provide mammograms to women in need. Special thanks to our vendors Coty and BSG who generously supplied gifts.